Manufacturer of a wide range of products which include caraway oil and rosemary oil. 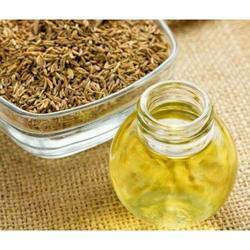 Caraway oil is extracted from the fruits of carum carvi. It is a bi -annual herb originated from Asia minor, but is now cultivated in northern Europe, Africa and Russia. This warming essential oil helps to relieve mental strain and emotional fatigue, while aiding the digestive and urinary system and clearing the respiratory system. At the same time it also fights skin and scalp conditions. The chemical components of caraway oil are acetaldehyde, cumuninic aldehyde, furfurol, carvone and limonene. Caraway oil calms the nerves and soothes mental fatigue, while settling the stomach, nervous digestion, colic, flatulence and gastric spasms. It is an effective tissue re-generator and useful for fighting oily skin while dispersing bruises, reducing boils and cleaning infected wounds. Furthermore, it relieves itching skin and helps to clear acne as well as scalp problems. Uses: In manufacturing liquors and perfuming soaps; flavor for cookies, candies. 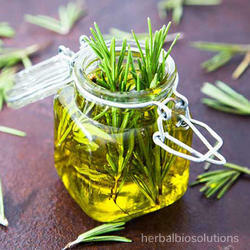 Rosemary oil is obtained from the leaves of rosmarinus officinalis. It is a woody, perennial herb with fragrant evergreen needle-like leaves native to the mediterranean region. It is being used in aromatherapy and have various health benefits including stimulate hair growth, boost mental activity, relieve respiratory problems and reduce pain. The important volatile constituents present are cineole, pinene, borneol, linalol, alpha terpineol, terpinen-4-OL, bornyl acetate, camphor, thujone, camphene, limonene, beta -caryophyllene. Flavonoids (apigenin, diosmin), tannins, rosmarinic acid, diterpenes (picrosalvin), rosmaricine are other componants present in this oil. Rosmaricine has been referred to as a stimulant and mild analgesic. The anti -inflammatory effect of the rosemary is mainly due to flavonoids and rosmarinic acid. It can be used for aching muscles, arthritis, dandruff, dull skin, exhaustion, gout, hair care, muscle cramping, neuralgia, poor circulation, rheumatism.